As adults, we face dozens of problems every day. Will we have time to buy milk today? How do I tell my coworker that she talks too loudly? What's the fastest thing to make for dinner? Where will we go this weekend as a family to play? Solving problems is a skill every human should have, and it's one we all cultivate in childhood when we play. 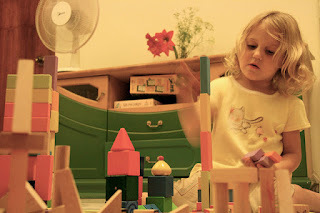 I watch my girls build problem-solving skills every day in seven ways. I don't often tell my girls what to play because they need to make those decisions on their own. My plan is to raise girls who can think and solve problems independently. They learn this skill as they enjoy free play and decide what playtime activities to enjoy and how to do those activities. That independence during play helps them become independent thinkers as they grow into adulthood. Sometimes, we only have seconds to solve a problem. In those instances, the ability to improvise comes in handy. Kids can learn to improvise during dramatic play. The other day, I watched my girls play doctors. They didn't have their doctor kit nearby but quickly used a jump rope as a stethoscope and a scarf as a tourniquet. These improv skills will help them in the future when they have to make quick decisions. Almost every day, our kids face interpersonal problems as they interact with friends, siblings, and classmates. Through social play, they develop the interpersonal skills they need to solve these problems. My girls have learned during play time to communicate, share, and compromise. They take turns being the star of the show, ask friends which game they want to play, and don't hog the swing. These skills will help them as they navigate friendships, succeed at work, and have families of their own. As adults, we can't ask everyone else's opinion before we solve a problem. We have to be confident that we're making the right decisions without constantly second-guessing ourselves. I'm glad that our kids build this self-confidence as they play. They learn more about their likes, interests, values, and talents as they play games and sports. Give your kids opportunities to play and they will gain the self-confidence they need to make their own decisions. Problem-solving often requires me to think about someone else. I can't decide where to eat dinner, what game to play, or when to run errands without considering my family's needs. Play helps our kids appreciate other viewpoints. Not only do they learn to appreciate the interests, feelings, and desires of their playmates, but they also they learn about diversity and other cultures, traditions, and religions as they play. They will need to appreciate the viewpoints other people have as they solve problems in the future. One of my daughters enjoys books that allow the reader to choose from several endings. There are no wrong answers, and it's like reading a different book every day! I thought about those books today as I reflected on how play can teach our kids to be better problem-solvers. They may ask questions like, "How far will the water from this squirter reach? How many blocks can I stack before the wall falls down? If I wear sandals to hike, will my feet hurt?" Considering the outcomes as they play prepares them to question, examine, and think critically as they make decisions in their everyday life. Sometimes, we won't make the right decision, and that's OK. Learning to make mistakes and dealing with the consequences is part of life. That's why I allow my girls to make mistakes as they play. For instance, one time, they pretended they worked in a hair salon and cut their dolls' hair. They learned a hard lesson that day, but I would rather they make mistakes and learn than not play or take any action at all. Play is important for childhood. I appreciate that it helps my girls become build problem-solving skills in seven key ways. How does play help your kids become better at solving problems?